Year in, and year out, America’s number one New Year’s Resolution is to lose weight. Our own unhealthy eating habits, especially over the holiday season, are often shared with our pets. We all are guilty of showing love through cookies and treats. Before long, those treats cause our pets to pack on the pounds. 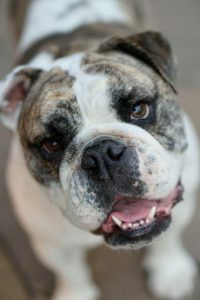 Obesity can lower your pet’s life expectancy and contribute to illnesses such as diabetes, arthritis, high blood pressure, and certain forms of cancer. This is the year, not only to get yourself into shape, but to help your pets get healthy too. It seems so simple, but this is where it all begins. Knowing exactly how many calories your pet ingests in a given day is extremely important. Slow and steady reduction in calories wins the weight loss race. Begin with a 10% reduction in caloric intake and monitor your pet’s weight monthly. Weight loss should be gradual as rapid loss may lead to metabolic consequences. 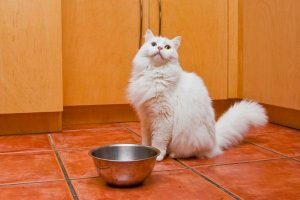 Pets with ravenous appetites may not tolerate being fed smaller amounts. They might begin to act out by becoming more demanding during feeding times, may engage in resource guarding (becoming protective of food), or ask for food at all times of the day or night. Over the counter “light” foods have fewer calories yet contain more fiber causing the pet to feel full and allowing them to eat a similar volume of food to “pre-diet” days. Special prescription diets are available as well and may help complicated cases lose weight when over the counter options fail. Go for a longer walk around the neighborhood. Get out a ball. Go for a hike. Make your cat hunt for kibble – by placing food in high perches or on shelves. A feather wand or laser pointer can provide excitement and exercise for your indoor kitty. Increased aerobic activity will burn calories and strengthen muscles. Increased muscle mass will increase metabolic rate and help your pet use calories rather than store them as fat. As few as extra 30 calories a day, the equivalent of three small Milk Bone treats, can lead to weight gain especially in smaller breed pets. Treats should be calculated as part of your pet’s total daily caloric intake. Breaking treats into smaller pieces or using baby carrots, green beans, celery, sliced apples, or bananas (try a flake of salmon or tuna for cats) can lesson the impact of treats on a successful diet plan. There may be an underlying medical condition causing or contributing to your dog’s excess weight. Hypothyroidism, in particular, is an example of a metabolic disease that might cause significant weight gain in dogs. Underlying disease conditions are ruled out by performing a thorough physical examination and submitting samples for blood chemistry and hormonal analysis. After you and your veterinarian have devised a weight loss plan, it is crucial to monitor progress. Your pet should be weighed at least once monthly until their ideal weight is achieved. If weight loss does not occur, your program should be reassessed and modified. Begin your pet’s weight loss journey by tracking how much your pet is currently eating, assessing current exercise habits, obtaining a current weight, and scheduling an examination with your veterinarian. With this information, we can help you build a winning weight loss program.